CURRENT STATUS OF THE DENTAL PRACTICE IN BULGARIA. Meta-analysis. The purpose of this study was to show the leading trends in dental practice and dental profession development after two decades of transition. Materials and methods: A systematic review of data was performed including analysis of secondary statistical data and benchmarking data from relevant publications. Conclusions: The extensive growth and irregular distribution of dental practices, along with the decrease of the dental services’ utilization shape the portrait of the dental profession and dental practice in Bulgaria by the end of the first decade of 21 century. Key words: dental practice, dental practitioner, dental service utilization, dental staff, professional status. 2. Special eurobarometer oral health 330. 14. Katrova L. Leading trends in dental profession demography in Bulgaria for the period 1996-2008 (OP112). 14th Congress of BASS, 9th Scientific Congress of the BgDA. 6-9 May 2009 Varna. 15. Katrova LP. Bojinov I. Mihailova. Oral Health Care reforms in Bulgaria during the period of transition. 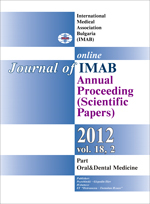 Oral health and Dental Management in the Black Sea Countries, 2007, Vol. VI, No 4, pp 3-8.